Just over a year ago, President Obama created the newest American National Park at Pinnacles in California. The park protects unique volcanic formations as well as breeding habitat for the endangered California condor. While a success for biodiversity protection in America, Obama’s designation of Pinnacles as a National park is unfortunately in contrast to a growing trend around the world of reducing the size and scope of protected areas. Officially called protected area downgrading, downsizing, and degazettement (PADDD), this is a phenomenon that threatens to undermine years of work protecting globally unique ecosystems. However, there are lessons to be learned from PADDD. 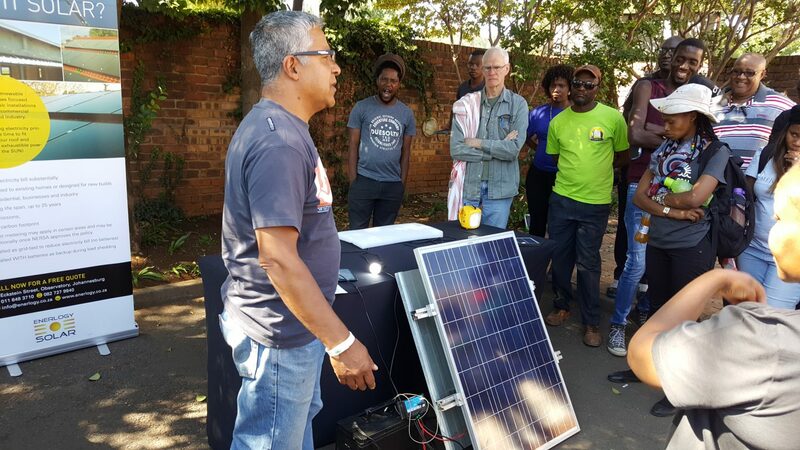 Most importantly, examining the factors that drive PADDD highlights the importance of considering political and social factors, as well as environmental, when developing protected areas. A recent WWF study in Biological Conservation (summary here) documenting PADDD events in Africa, Asia, and Latin America has helped to shed light on the extent and causes of PADDD in areas which contain more than 70% of the world’s protected land. Utilizing the UN database of world protected areas, internet and database searches, and interviews with 128 regional protected area (PA) experts, they put together a list of 543 PADDD events in 57 countries across three continents from 1900 to 2010. PADDD, as defined, is a broad term and the three categories (downgrading, downsizing, and degazettement) do not happen with equal frequency. The authors found that downsizing was the most common, followed by degazettement (where the park fully loses protection and ceases to exist as a park), and downgrading (where the legal human uses of the park are expanded). 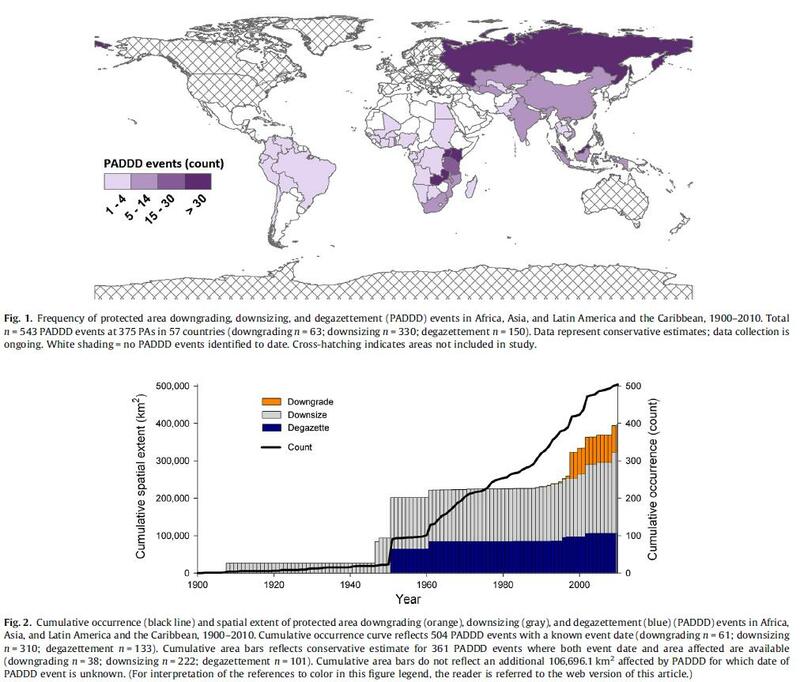 As the figures quoted below show, the instances of PADDD have increased as the number of protected areas (PAs) around the world has increased; the total area affected (now upwards of 1,000,000 acres) has also increased. The forces driving PADDD are varied but two of the most interesting which the authors discuss are local land conflicts and industrial resource extraction. While conflicts between local communities, particularly indigenous peoples, and park sponsors have received a fair bit of attention in both popular and academic press, this study finds that fewer than 20% of PADDD events are driven by local land claims. The major driver of PADDD events, rather, is industrial resource extraction – particularly mining – which accounted for nearly 40% of the events in the study. This suggests that the biggest threat to PAs is not expanding local communities but rather connections between industrialized resource extraction and political figures. 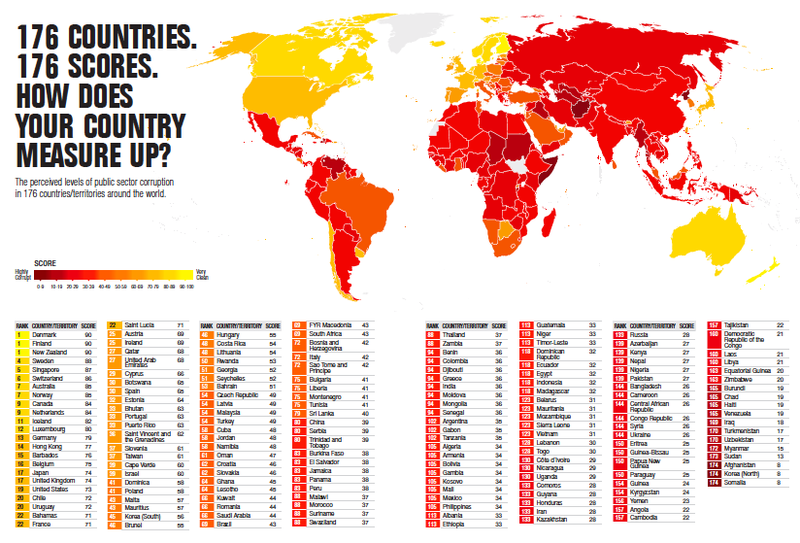 While the authors of the discussed study make no claims about the methods utilized by industrial resource extractors to gain access to PAs, it is impossible not to note the geographic overlap between countries with high numbers of PADDD events and high levels of corruption. It is this overlap that highlights perhaps the most important lesson of the recent study: simply creating a park does not guarantee eternal protection, regardless of what the charter of the park may say. Rather, protection is dependent on continual political support from the highest levels (if the threats come from industrial resource extraction) and the local level (in the case of local land claims). Parks are not created in a vacuum. They can be a useful tool for biodiversity protection or environmental conservation but they exist in a larger political, social, and economic context. Parks that are created with an eye towards involving, and benefiting the local community are more likely to succeed. Community by in not only means the park faces less direct threat from locals in need of a source of livelihood but it creates another stakeholder group that will fight to protect the park if it is threatened. But the real lesson of the new PADDD research is that fighting corruption is just as important as creating protected areas when it comes to preserving biodiversity; a lack of corruption at higher levels guarantees that the protection of the park will not be rescinded to benefit a specific interest group. The combination of a strong civil society and transparency in government will lead to improved biodiversity protection. 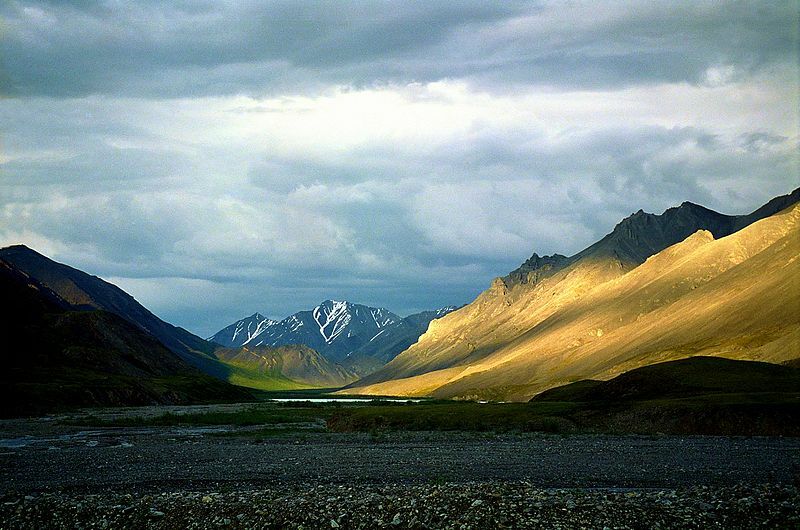 Take for example one of the most threatened protected areas in the United States: the Artic Wildlife Refuge. For years some have argued that it should be opened for oil exploration. It is because of the combination of extensive opposition from local indigenous communities, the existence of a government which responds to citizens, and the inability of oil companies to buy off American politicians that it remains protected. As long as parks continue to exist PADDD will be a problem. But now we have a greater understanding of where and why it happens and even more reason to strengthen local economic development and anti-corruption programs. One day the protection granted to a place like Pinnacles will become truly permanent, regardless of where in the world that place may be.